What’s a special way to show your support for those afflicted with a life-threatening disease or condition? One creative method is getting dunked in a water tank in front of hundreds of co-workers. This is what took place for local company OptumRx as part of its fundraising efforts for the American Cancer Society’s Making Strides Against Breast Cancer campaign. On the grounds of OptumRx in Carlsbad, more than 300 employees gathered for a colorful Hawaiian-style luau and barbeque. 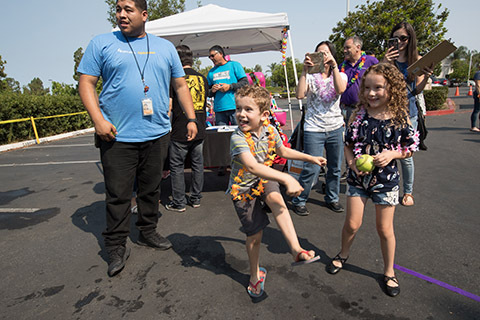 The Aug. 10 event featured various cash-to-play games, including a chance for staff members to pay for the privilege of trying to sink their supervisors. The friendly activity called for participants to throw a ball against a small target that would release the seated “victim” into the dunk tank. “I think it rallies our entire team,” said Phong Ly, an OptumRx pharmacy director, about the dunking and other lively activities. He coordinated the fundraising event. Ly, a Temecula resident, has been an enthusiastic supporter of the Making Strides campaign. Under Ly’s leadership, OptumRx set a goal to raise $15,000 for the Making Strides Against Breast Cancer walk on Oct. 21 in San Diego. As part of UnitedHealth Group’s Giving! Program, employee donations will be matched, doubling the amount of money raised at the event. Making Strides continues to grow in popularity around the San Diego area and is one of the nation’s biggest charity efforts. The campaign culminates each fall with hundreds of local fundraising walks that involve thousands of participants. These walks, which encourage participants to wear pink, have traditionally relied on a diversity of businesses to encourage their employees to step forward, make donations and walk the walk. This year, the major local walk event takes place at Balboa Park. Ly and many of his OptumRx co-workers will be there. Their participation is just one way of showing concern and compassion for cancer victims that many of them know on a personal basis. Making Strides is a major fundraising campaign for the Atlanta-based American Cancer Society, which estimates 250,000 people will be diagnosed with breast cancer this year.